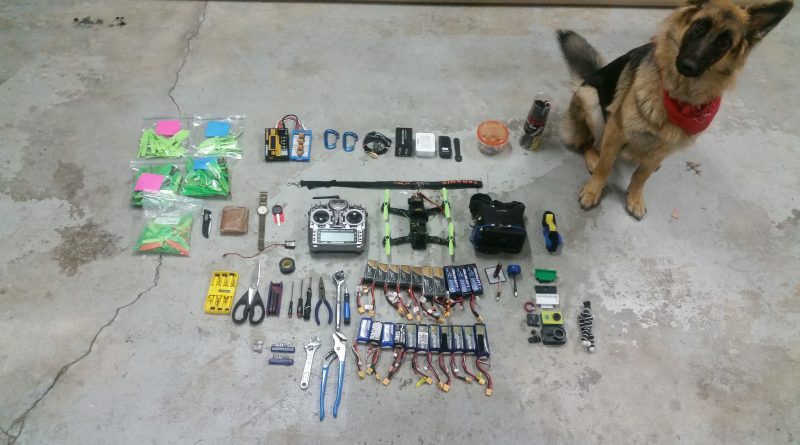 This is everything that I carry with me when I’m out flying. Ask any questions about the purpose of anything in the comments below! 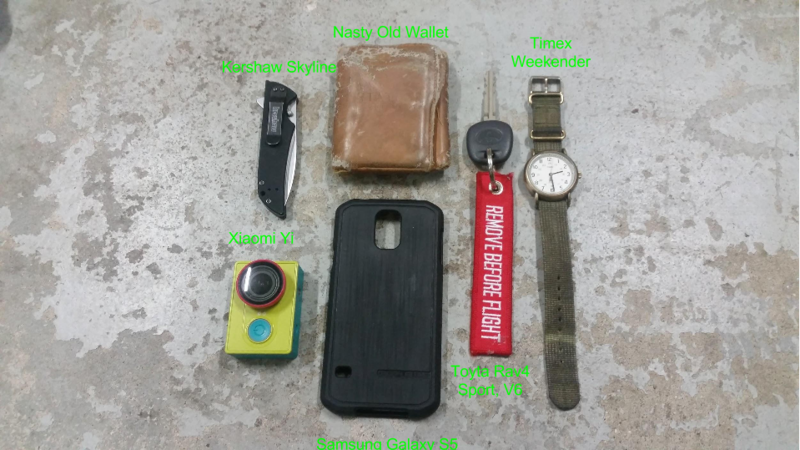 This is my “everyday flyer”. It’s the ship I always go back to. It has relatively cheap parts on it, so I am not afraid to fly it through gaps or go as fast as I can. It’s not the fastest ship in the world, but I love how it’s turned out so far. 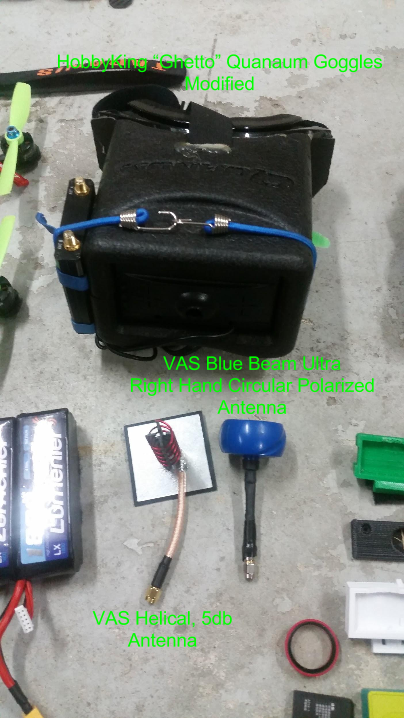 Click here to read a lot more about The Green Machine and learn and all of it’s individual parts: The Green Machine. Scissors are nice for cutting zip ties, which are a godsend out in the field. It CAN be done with a knife, but it’s a pain. Allen Wrenches are supplemental to the M2 and M3 drivers which are easy to misplace or forget. Needlenose pliers help get into tight spaces, where big, meaty fingers like mine won’t quite reach. My Prop changing tool is a ratcheting wrench. It works amazingly well for nylock nuts that you use to make sure props don’t fall off mid flight. Battery voltage checker can be plugged into the second set of cables on the batteries, and this one has a beeper in it, and will warn me when the battery on my drone is getting low. These are all of the batteries I currently own. 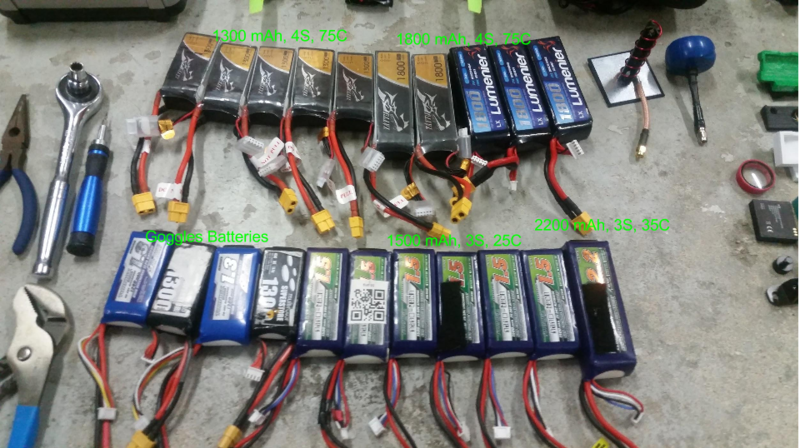 The top row are all 4 cell batteries, meaning that they have a peak voltage of 16.8 and produce much more power than their 3 cell counterparts on the bottom row, topping out at 12.6. They are monster batteries and allow my drone to SCREAM! I carry a LOT of propellors. 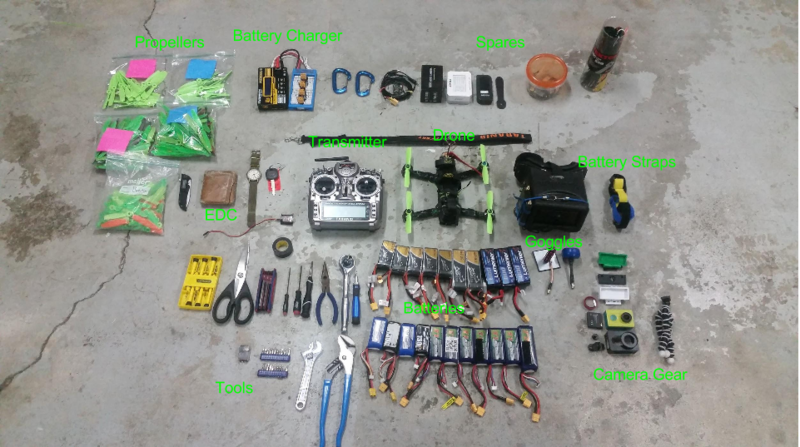 Contrary to flying planes or helicopters, flying drones results in a LOT of broken props. And , while unfortunate, it’s a necessary evil that you’re going to break a lot. As a result, I carry a lot. The top two packs are 5045 bullnose DAL props, which are my current favorite to fly. 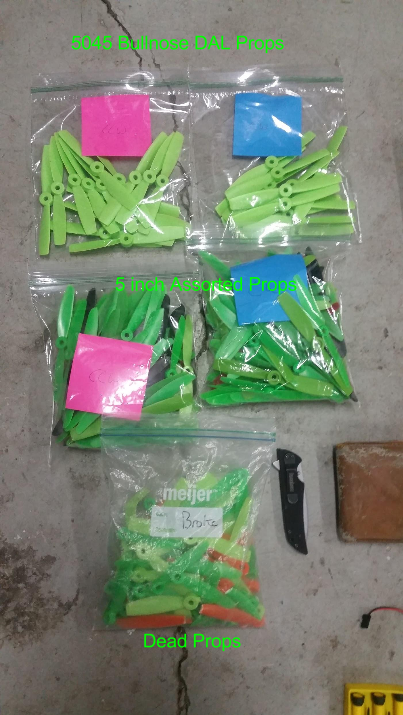 The middle row are assorted 5 inch props, ranging from 5030s to 5045 bullnose. Bullnose means that the tip is flat, rather than pointed. Props with flat tips have more surface area, and as a result produce more thrust. BUT they also draw more power. D4R-II Receiver — not actually prone to breaking, but you can accidentally rip off an antenna, and without that, you’re stuck! 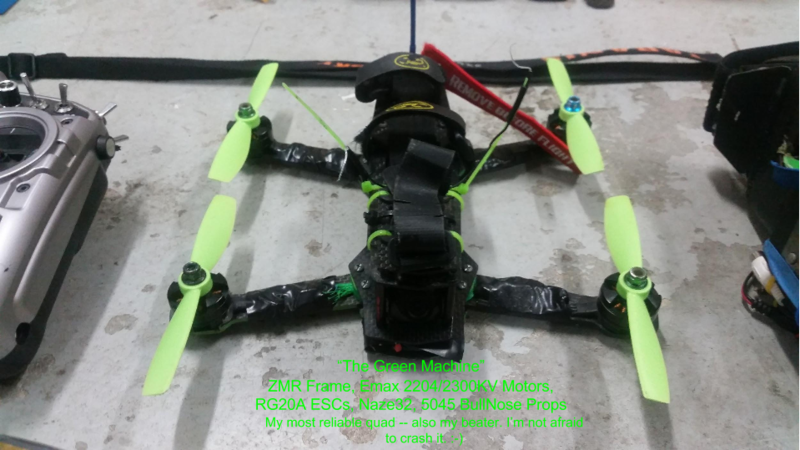 FPV Camera — it rides along at the front of the craft and can easily get smashed in. I carry a spare so I can quickly swap it out if need be. Motor — I go through these like candy. If I land directly on one, or hit one directly on something, there’s a good chance for the motor shaft to bend, and when that happens it’s un fliable. 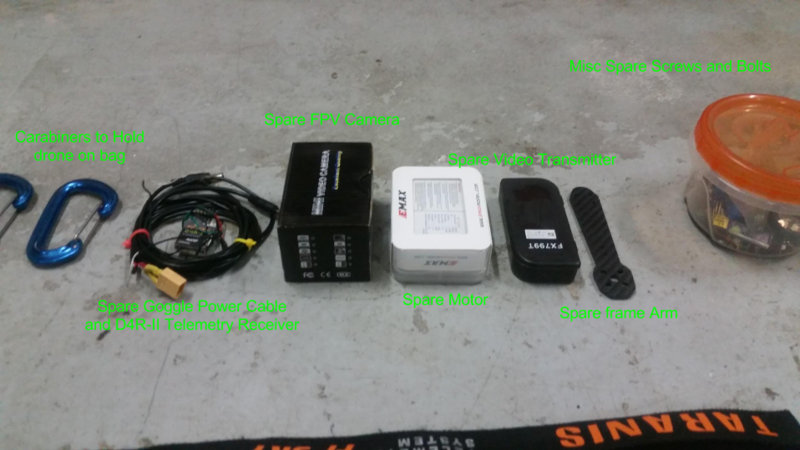 I’m easily able to swap a motor in the field with a soldering iron and some patience. Arms — Frame arms are the most likely part of the chasis to break so having 1 or 2 extra is a good idea. So yeah — my quad carries TWO cameras. One camera sends back the video signal to my goggles, and transmits that information in real time. This Camera, the Xiaomi Yi, is just a recording camera. It’s a go-pro knockoff that does 1080p @60FPS, so it records some good looking video. I always carry a spare battery and a lens protector is a must! 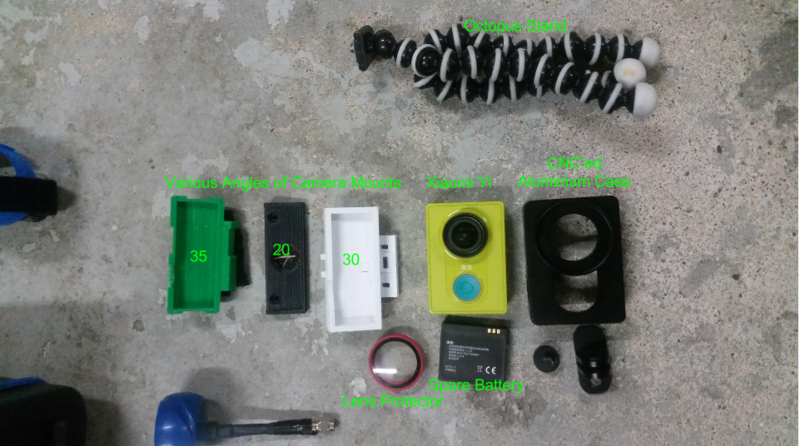 Each of the camera mounts on the side are 3D printed, and I will strap the camera into the mount on top of the quad. The mounts have different angles on them so that, when the quad tilts forward to fly fast, the camera will be tilted to level, so that you’re not just staring at the ground the whole time. 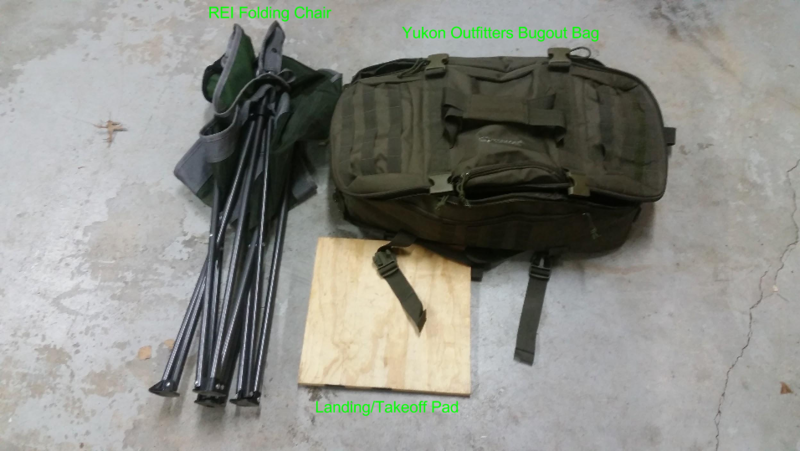 The bag is a Yukon Outfitters Bugout Bag. I LOVE this bag because everything pictured (except the chair and landing pad) can fit into the bag nice and comfortably, and then I strap the drone to the outside with a couple carabiners (it’s pretty rugged — doesn’t need that much protection). The chair is a folding chair from REI. It’s doable to FPV standing up, but it’s a little awkward and tiresome, so I almost always sit. Finally, the landing pad is nice because my quads are “low riders” — they don’t have landing gear of any kind to save weight, but that means that if you try to take off in grass, the props are going to get stuck and it won’t get off the ground! Timex Weekender — my favorite watch I’ve ever owned. I forget I’m wearing it because it’s so comfortable. I like my Rav4 — not my first choice in car, but it meets needs. Kershaw Skyline G10 Knife — I love this knife. Very slim, stays in the pocket, and just great. I wouldn’t use it to pry something open, but for every day needs — it’s great. In general, that’s everything that I’ll carry with me! I’ll often bring my laptop out to do some troubleshooting on the drone software. 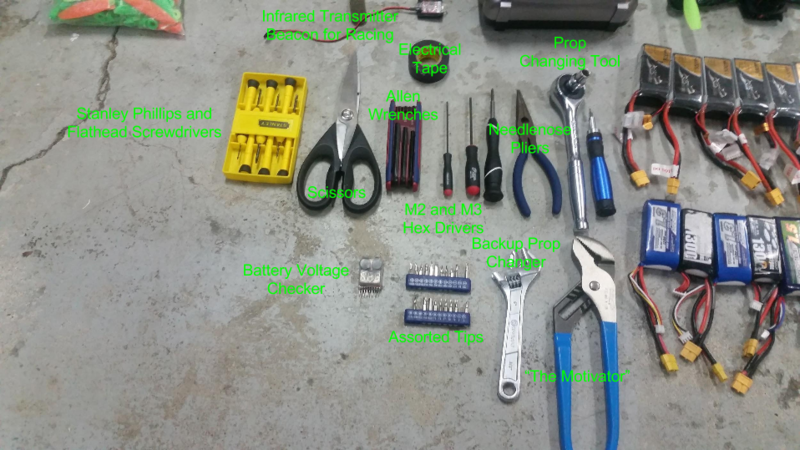 I consider my car a part of my EDC because, as often as possible, I try to fly within range of the car so that I can charge my batteries and not have to lug all this crap far. But if I have to, it’s no big deal. Thanks for reading! If you have any questions, please don’t hesitate to leave a note! Also feel free to follow me on instagram! Pingback: No Better Than Average Podcast | paul.